Jack Dacey, Guilford: Hat trick in a 6-3 win over North Haven. Aaron Dibble, NFI: Three goals in a 6-2 win over SGWL. Spencer Engstrom, Branford: Two goals in a 5-2 win over Hand. Tatum Fitzmaurice, Hand: A goal and two assists in a 5-3 win over Sheehan. Noah Fleming, Northeastern: Scored twice in a 5-2 win over Wilton. Michael Gethings, Hamden: A goal and an assist in a 6-4 win over West Haven. Justin Hazard, Glastonbury: Four goals and two assists in an 8-3 win over Amity. Jack Healy, WMRP: Three goals in a 5-3 win over the Eastern CT Eagles. Tucker Healy, Westhill/Stamford: Three goals, including the game-winner, in a 7-4 FCIAC-quarterfinal win over Fairfield. Ryan Huta, Eastern CT Eagles: Had a hat trick and three assists in a 9-2 win over SGWL in the Nutmeg Conference semifinals. Rowan Masse, East Catholic: Scored the goal in a 1-0 win over Conard that sent the Eagles to the CCC North playoffs. Chase Maxwell, Xavier: Hat trick, including a goal in overtime, in a 4-3 win over West Haven that ultimately gave the Falcons a home game in the Division I tournament. Travis Nussbaum, JBWA: Four goals, including the game-winner, and set up the goal that put the Knights ahead for good in a 6-3 win over New Milford to clinch an SCC/SWC playoff berth. Kyle Roberts, LHK: Three goals and an assist in a 4-1 win over East Haven. Mike Shuman, Tri-Town: Two goals in a 4-1 win over Milford. Owen Stacey, E.O. Smith: Two goals and two assists in a 4-1 win over WMRP. Brendan Stoner, North Branford: Three assists in a 4-0 win over Masuk that clinched a Division II playoff spot. Jake Walker, Fairfield Prep: Made 40 saves in a 1-1 draw with tradition Massachusetts power Catholic Memorial. 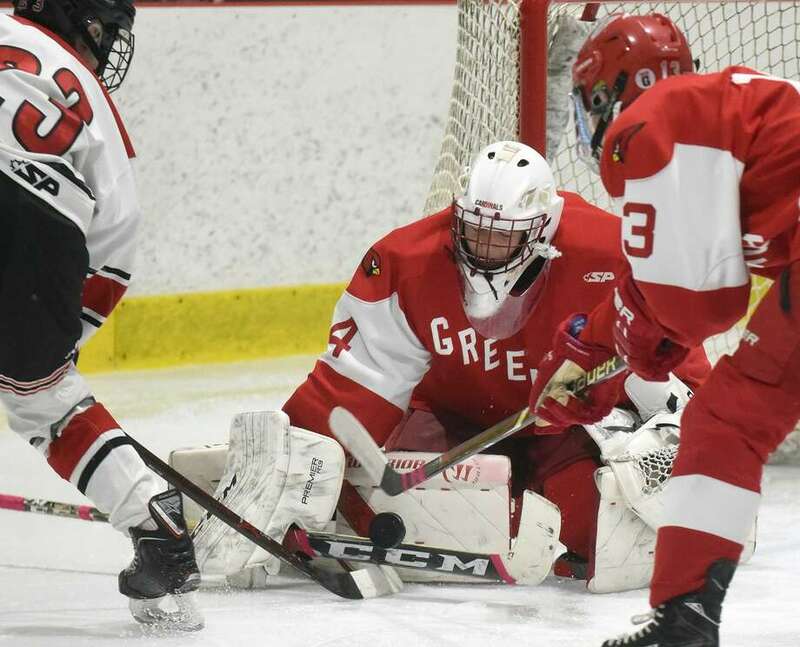 Charlie Zolin, Greenwich: Stopped 25 of 27 in a 3-2 FCIAC-quarterfinal win over New Canaan. Nutmeg Hockey Conference at Connecticut College, Thursday, 6 p.m.: The host and defending champion Eastern Connecticut Eagles await the winner of Tuesday night’s semifinal between Woodstock Academy and Tri-Town. SCC/SWC Division I at Bennett Rink, Friday, 6 p.m.: Fairfield Prep and Hamden meet for the third time this season. The Jesuits won both regular-season meetings, 4-2 at midseason and 6-3 on Saturday. SCC/SWC Division III at Bennett Rink, Friday, 8 p.m.: Interloper Newington keeps this tournament from being the top four CIAC Division III seeds, like Division II. Sheehan meets Hand in Wednesday’s semis in Milford, followed by LHK-JBWA. Defending champion Sheehan is the only one of these four teams to win this tournament since it went to three divisions in 2014; Hand and Sheehan have won the old SCC Division II tournament, while Barlow won two SWC Division 2 titles. CCC South at Trinity College, Saturday, 9 a.m.: Trinity College has an afternoon home playoff game. The semifinals are Thursday night, Hall/Southington at WMRP (these are the only playoffs Hall/Southington has) and Newington at E.O. Smith. SCC/SWC Division II at Bennett Rink, Saturday, 4 p.m.: The top four seeds in Division II have at it. No, we mean quite possibly the top four seeds in the state in Division II. In this pairing, Thursday’s semis at Bennett pit Watertown/Pomperaug against Cheshire and Branford against Guilford. In a couple of weeks, it could be WP-Branford and Cheshire-Guilford. FCIAC at Hamill Rink, Saturday, 6 p.m.: The competitors include Darien (last title: 2015), Greenwich (last title: 2016), Ridgefield (last titles: 2017, 2018) and Westhill/Stamford (last title: for Stamford, 2003, Westhill, never). CCC North at Trinity College, Saturday, 7:30 p.m.: Two-time defending champion Northwest Catholic has East Catholic in Thursday night’s semifinal. Glastonbury and Farmington Valley meet in the other semi, with the site to be determined Wednesday.